Jewelry, Art and Life: One Lovely Blog Award! 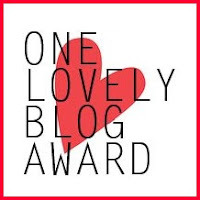 Well, after a frustrating day spent mostly in bed due to tummy troubles, I opened my email at the end of the day and found a lovely note from Bobbie at Beadsong Jewelry who was passing on her good karma at being nominated for the One Lovely Blog Award. She nominated my blog for the award! 1. Thank the nominator and link back to them in the post. 2. Share 7 random facts about myself. 4. Contact them to let them know that they've been nominated. 1. I spent many years working as a veterinary technician, and then as a compounding pharmacy technician. For a while, I thought I was going to go to veterinary school, but I was totally intimidated by the cost of 8+ years of college and and the idea of having to take out over $100k in loans to finance it. Although I loved working as a compounding pharmacy technician, making prescription medication to doctors' specific orders, I never had the desire to become a pharmacist. 2. I started college as a music major, concentrating on piano. The idea was that I was going to study music therapy. I'd only been playing piano seriously for about two years when I was accepted, and I was never really comfortable performing with some of the heavy-hitters in my music theory classes. I always felt that they were way more talented than I, and so I dropped music therapy and dropped out of college for a while. 3. There are certain movies and television shows that I can recite by heart. A Fish Called Wanda is one, as is pretty much every episode of Monty Python's Flying Circus. Other movies include French Kiss (with Kevin Kline and Meg Ryan), History of the World Part I, High Anxiety, The Muppet Movie, and pretty much every episode of Andy Richter Controls the Universe. Sometimes, when I can't sleep at night, I run through these in my mind as a way of relaxing and getting to sleep. 4. I am a total Harry Potter freak. I own all of the books in first edition hardcovers, complete with dust jackets, and I attended every midnight release party except for the last. When the last book came out, I was pregnant with Colden and incredibly sick. I couldn't get to Plattsburgh to the Borders to pick up my reserved copy because I was so sick that night. But the next day, I gulped down my horrible anti-nausea meds, got into the car with Tom, and hobbled into Borders to get my copy. I stayed awake that night until 2 a.m. and finished it, even though I was sick as a dog the next day. 5. I didn't learn how to cook (properly) until I stopped eating meat. I don't know why it happened that way, but once I went vegetarian, I suddenly discovered that I LOVED to cook. Before that, I had subsisted on things like boxed pasta dishes, steamed vegetables, sauteed chicken breast, and green salad. As you might know from this blog, I enjoy spending a great deal of time in the kitchen and would love to write and publish a cookbook one day for gluten-free vegetarians! 6. Despite the fact that I love movies and certain t.v. shows, I gave up watching t.v. when Tom and I moved into our apartment in Lake Placid back in 2000. We didn't get any television reception there in that big bowl in the center of the High Peaks, and since Tom wasn't making much money and I was a full-time student, we just gave it up because we couldn't see spending the money on cable. I truthfully don't miss it and sort of enjoy being bewildered when I see celebrity photos online and wonder, "Now, who the hell is THAT?" 7. The first time I drove a four-wheeler during an ice fishing trip, I was convinced that I was going to break through the ice and drown. Our friend Tim wanted me to be "Bait Girl" one afternoon, so whenever someone was out checking the lines after the flags went up, they would signal to me, and I would hop on the four wheeler with the bait bucket between my knees and drive across the ice to wherever I was needed. It was a lot like the summer I worked at the Bergen County Zoo and drove the little Cushman around, but with the added adventure of driving over ice as it popped and cracked in the dead of the Adirondack winter. 8. And one more, just because this one is really good: I am terrified of worms. I can't stand them. If I see them in the soil while we're working in the gardens, I run. When the warm spring rains comes and the worms all come out and take up residence on our huge driveway, Tom will have to park right up next to the back door so that I can make it out of the car and onto the back stoop without having to risk squishing one of those fatties with my shoe. 1. Kerrie Slade. 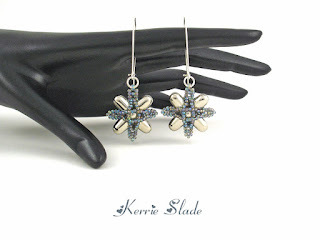 Kerrie is a beader from the UK who does some absolutely fantabulous stuff with beaded flowers. Not the kind made with wire, but stitches with needle and thread. I've admired her beaded flower creations for years, both bold and delicate, and have followed her journey this year as she has set out to create using a single color palette. 2. MADDesigns (Marcia DeCoster). Marcia was one of my original inspirations for starting my own blog. She just made it look so EASY and interesting! She was also someone who contacted me after my first cover of Beadwork magazine back in 2007, and I so admire her talent and her business acumen! Her blog is highly engaging and full of absolutely amazing eye candy. 4. Peter Sewell. Sadly, my nomination for Peter Sewell's blog, The BeadSage, has to be a posthumous one. Peter lost his life to cancer earlier this year, but he was such an inspiration to me. He created structurally amazing beadwork using Swarovski beads and stones as well as gemstone cabochons and beads, and his work could easily be described as "breathtaking". He proclaimed himself to be something of a curmudgeon, but we all knew better. He had a wicked sense of humor and great taste in music, and he is sorely missed by the beading community. 5. Pretty Things (Lori Anderson). Another bead blogger who inspires me on a daily basis, Lori Anderson is the brains behind the Bead Soup Blog Party, and one pretty darn talented lampwork and jewelry making artist. Her blog is full of life and love and great ideas, and her recently published eBook, Follow the Path, is a favorite resource of mine for when I get stuck and need something to blog about. 6. SandFibers (Carol Dean Sharpe). No list of my favorite blogs would be complete without including Carol Dean Sharpe. She's my hero, standing up to the copyright thieves of the world while single-handedly creating astounding charted peyote stitch patterns. Even though I've never met her in real life, Carol has talked me through some of the toughest times of my life in the last few years. She's sweet, and wonderful, and probably one of the best people I've ever come across online. 7. SaraBeth's Belly Dancing Bead Blog (SaraBeth Cullinan). Belly dancing and beading - what's not to love? I can't remember the first time I ever had contact with SaraBeth, but it was probably when I was writing for About.com. I love her sense of color, her sense of style, and the fact that she's a work-at-home mom . Her beadwork graces the pages of Margie Deeb's color reports, as well as the pages of Beadwork magazine. 8. The Beaded Carpet (Mikki Ferrugiaro). Mikki is another one of those bead artists who just make me wonder how the heck she comes up with her designs. 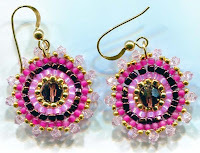 I first saw her work in the pages of Beadwork magazine, and she has gone on to create some really knock-your-socks-off beading designs. Mikki's blog is on hiatus right now as she moves to a new state and gets set up in a real studio, but enjoy her posts meanwhile! 9. Tapestry Beads (Jill Wiseman). Jill makes me giggle. Seriously. The first time I met her was at Bead Fest Philly back in 2009, and I had such a great time chatting with her. We stayed in touch via Facebook, and then I finally got to see her again last month at Bead Fest Philly again! Jill writes a great blog, is a great person, and just has a knack for making me laugh so hard that I snort water or hot chocolate out my nose. 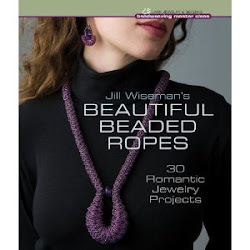 She's also the author of the recently released and incredibly amazing Beautiful Beaded Ropes book, published by Lark. Check out her blog. It's fun. 10. The Writing and Art of Andrew Thornton. Andrew is an insightful, thoughtful, and extremely talented artist who creates jewelry and handmade beads and components. His blog is a beautiful collage of both the personal and professional. 11. Beaded Bear's Nonsense and Complete Waste of Time (Sig Wynne-Evans). Okay, so this blog is definitely NOT for the faint of heart. Sig is a fabulously talented beading designer who also calls it like she sees it. This is one blog that makes me laugh out loud when I read it, regardless of where I am. Whether you're reading about her adventures at work, with her daughter and son-in-law, or on her latest quest to get fit and lose weight, Sig will have you coming back for more! 12. The Mommy Chronicles. Now, I know that this last one isn't a beading blog, but it's a blog by a friend of mine that I've known since middle school, and I love it. Melanie is a thoughtful parent trying to raise a thoughtful little girl. And that's it! Melanie lives her life with compassion, and I greatly admire her for this. It's a good blog. So, there ya have it! Twelve bloggers that I admire, and thanks again to Bobbie for nominating me for this wonderful award! I may not be able to come up with fifteen, as I don't read as many blogs as you do, but I will do my best!! Thank you again! Congratulations on your award and thank you so much for including me in your list. I'm familiar with all the other beady blogs, but not with the Mommy Chronicles. I'll have to go give that one a good look-see. This was such a lovely surprise Jen - thank you so much for including me in your nominations! I loved reading through your 'random facts' and I always enjoy the way you write as it is so descriptive and so now I have images of you reciting Monty Python at 2am and jumping over 'fatties' while squealing lol! Congratulations Jennifer you are well deserving of the award. I have always enjoyed reading your posts. Thank you for sharing some interesting facts about yourself and about the blogs that you chose to honor with this award. I will be checking out the blogs that I do not already follow. Jen, what a well-deserved award! I loved reading your random facts and all about your nominees!